South Africa have claimed their first win of the season, gaining revenge for their humiliation by Argentina in Durban seven day before with a thoroughly professional performance in Buenos. The Springboks were perhaps fortunate not to fall behind as early as the second minute, when Juan Imhoff stepped through the defence after a turnover on halfway, but Eben Etzebeth made a try-saving tackle and the Pumas never again seriously threatened the visitors' try line. 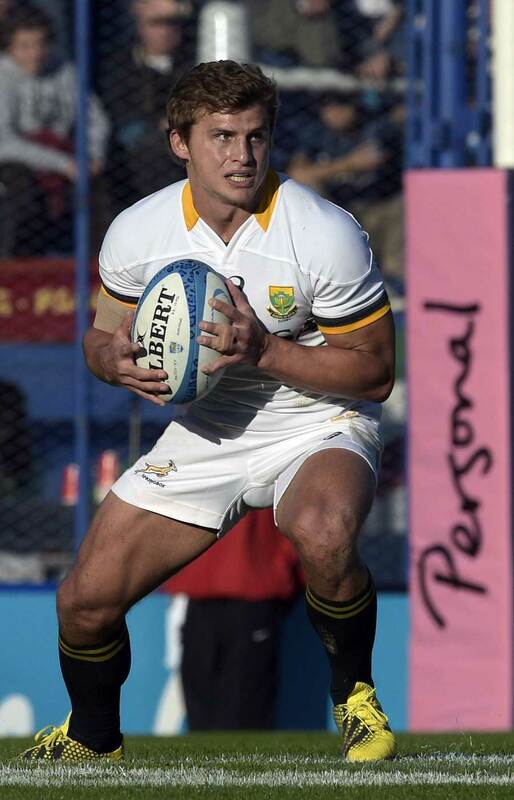 Pat Lambie was magnificent after replacing Handre Pollard as the Springboks' starting fly-half, and his cool playmaking and flawless goal-kicking was key to the South African victory. 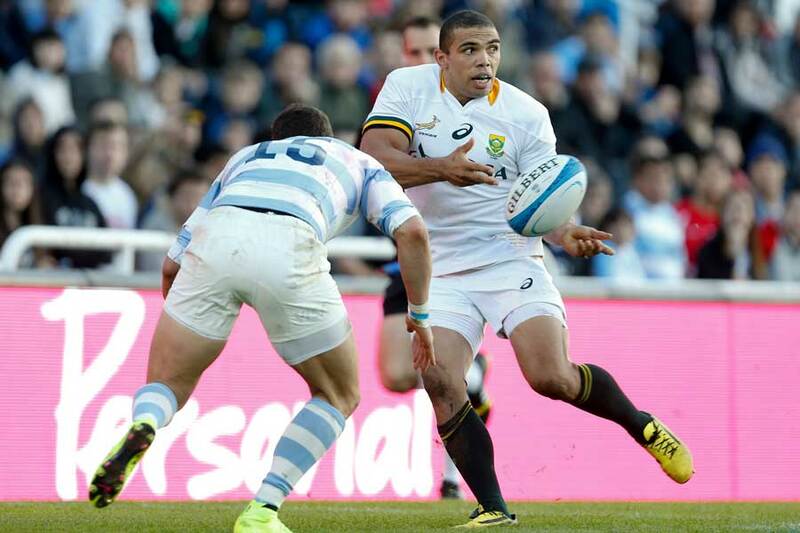 The Springboks put the game to bed with two tries in five minutes shortly before the half-hour mark; first Bryan Habana had a simple task when Ruan Pienaar found him as one of three unmarked players on the goal line with a quick cut-out pass after multiple phases, and then Lwazi Mvovo produced a strong run through weak Argentine defence after Schalk Burger had put him into a little space with a beautiful tip pass. Argentina and South Africa thereafter each struggled for rhythm in a game dominated by a physical breakdown battle and the whistle of Glen Jackson. South Africa displayed a totally different mindset from the match in Durban, their side showing eight changes demonstrating a hunger for success with the recalled Lambie outstanding at fly-half. Argentina, meanwhile, failed to replicate the scrum and breakdown dominance and backline creativity shown in Durban, and they were forced to attack far from the Springbok tryline after suffered two major pre-match blows with injured prop Marcos Ayerza and ill centre Juan Manuel Hernandez withdrawing. Lambie put South Africa ahead from a seventh-minute penalty and then the first scrum attracted huge interest given the Argentine dominance of that facet seven days ago. New Zealand referee Glen Jackson ordered two resets before the Pumas were penalised and the visitors achieved a huge psychological boost. 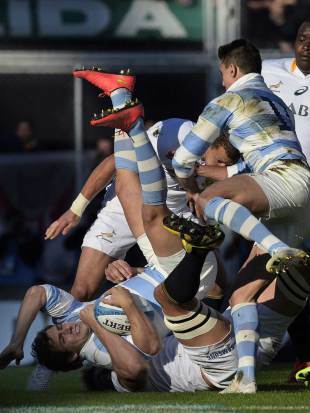 The second scrum also needed to be reset, with South Africa punished this time and Argentina fly-half Nicolas Sanchez slotted the penalty to equalise. Lambie kicked another penalty and the Springboks led 6-3 midway through the first half before Pumas loose forward Juan Manuel Leguizamon slapped the ball out of the hands of Ruan Pienaar to prevent a certain try in the corner. But the Springboks would not be denied much longer. Habana will not score many simpler tries, as he took a long skip pass from Pienaar and dotted down after sustained pressure. Lambie converted from the touchline and the 50,000 sell-out home crowd were silenced as Argentina trailed by 10 points. South Africa struck again just four minutes later thanks to a brilliant run by Mvovo after loose forward Schalk Burger had flicked a basketball-style pass into his hands. Mvovo, making a rare start, cut inside three would-be tacklers for a great score and Lambie had the easy task of converting. Rattled Argentina reduced the Springboks' advantage to 11 with two Sanchez penalties, but they never threatened to get much closer in the second hald, in which stanza Lambie kicked a drop goal and a penalty and Sanchez landed one penalty while Argentina lock Tomas Lavanini was sin-binned near the end for a no-arms charge into a ruck.